Is This Tom Cruise's Most Insane Mission Impossible Stunt Yet? 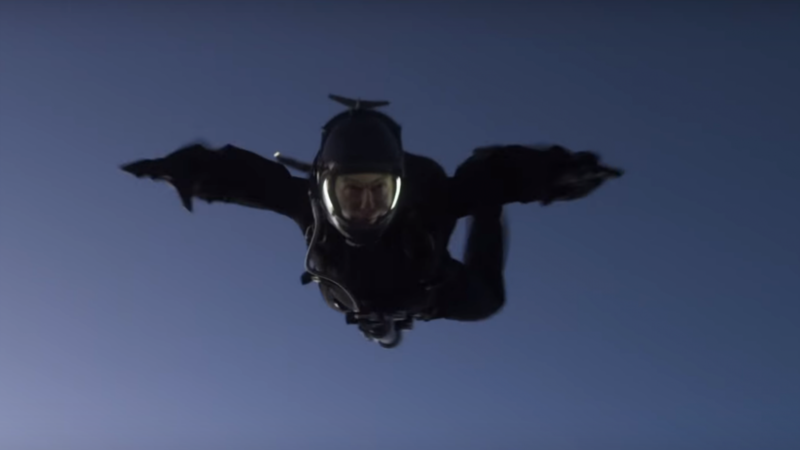 Is This Tom Cruise’s Most Insane Mission Impossible Stunt Yet? Mission: Impossible Fallout sees Cruse jump from a plane at 25,000, travelling 200mph. Tom Cruise might be the ripe old age of 55, but he’s showing no signs of slowing down on the action movie front. A seasoned veteran of what will soon be six Mission: Impossible movies, Cruise has never shied away from the franchise’s increasingly extreme stunts. He was dangled from the ceiling in the first movie, hung precariously from the side of a cliff without safety ropes in the second one and even scaled the side of the Buri Khalifa tower – the world’s tallest building – in the fourth film. In the last instalment, Mission: Impossible – Rogue Nation, Cruise climbed and hung on the outside of a flying Atlas C1, holding on as the aircraft reached over 5,000 feet. You’d think it would be difficult to top that in Mission: Impossible Fallout, but you clearly don’t know Cruise. Keen to up the ante, Cruise decided he wanted to be the first actor to do a HALO jump on camera. Something he’s been openly discussing with director and long-time franchise collaborator Christopher McQuarrie, HALO stands for High Altitude Low Open. It’s a type of parachute jump used by the military to land behind enemy lines undetected. You jump from 25,000 feet from a plane travelling anywhere up to 165 mph, waiting until you are just 2,000 feet off the ground before opening your chute. It’s an incredibly risky practice for the untrained, with risks including hypoxia or the bends. McQuarrie wanted to film the sequence as close to sunset too, meaning they had a daily three-minute window to get the shot. He practiced for weeks in a specially constructed wind tunnel – one of the largest ever made. He also spent 20 minutes on the ground, before take-off, breathing pure oxygen to prepare himself and ensure he didn’t get decompression sickness. Falling at a speed of around 200 mph, Cruise had to maintain a mid-air position that ensured he landed three feet away from a camera positioned 20,000 feet beneath him. The risk of a mid-air collision was pretty high. It was a risky move. Did he pull it off though? Check out the video above and decide for yourself. Mission: Impossible – Fallout arrives in cinemas on June 25. Is Tom Cruise Planning For A Top Gun 2 Without Val Kilmer?